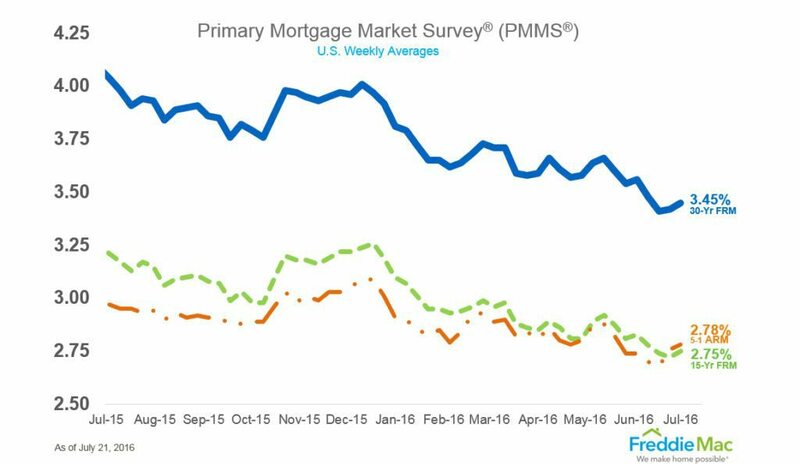 Mortgage applications for new home purchases decreased by 0.2 percent month-over-month. The three-month average loan size was $326,480 in June. Year-over-year, June new home purchases were up 7 percent. 30-year fixed-rate mortgages (FRM) averaged 3.42 percent with an average 0.5 point for the week ending July 14, 2016. This is up from last week when it averaged 3.41 percent. A year ago at this time, the 30-year FRM averaged 4.09 percent. Sales were up 0.7 percent year-over-year and 9.4 percent month-over-month. The median sales price was $229,900 — 2.2 percent higher year-over-year. 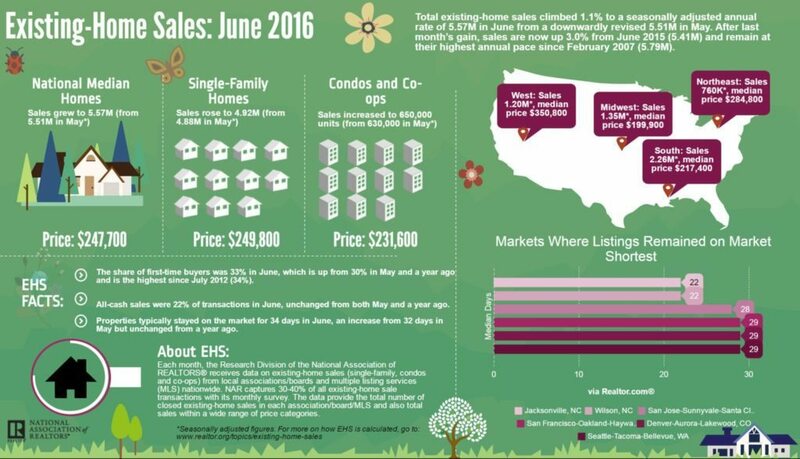 The number of homes for sale in June fell 15.6 percent year-over-year. Mortgage rates were down 0.29 percent post-Brexit. Completed foreclosures were down 6.9 percent year-over-year. Home prices were up 5.9 percent year-over-year. In May, the SAAR was 5.51 million. Last June, the SAAR was 5.41 million. 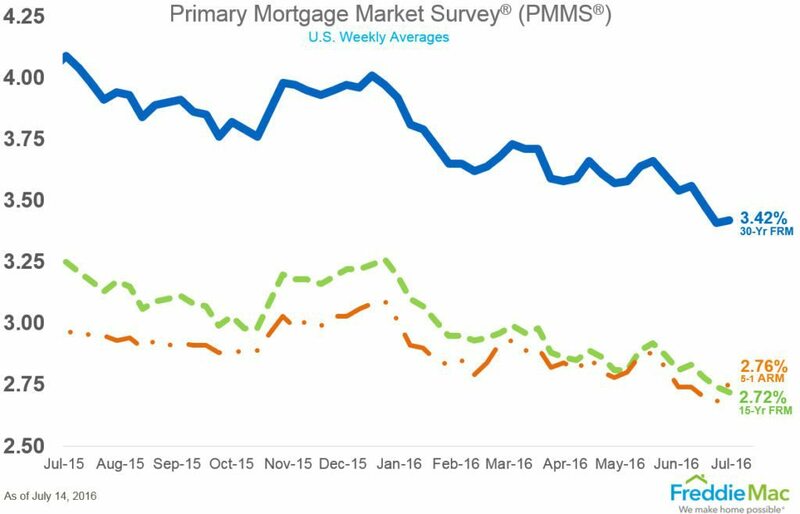 30-year fixed-rate mortgages (FRMs) averaged 3.45 percent with an average 0.5 point for the week ending July 21, 2016. A year ago at this time, the 30-year FRM averaged 4.04 percent. U.S. house prices were up 0.2 percent on a seasonally adjusted basis month-over-month in May. April’s increase was revised upward from 0.2 percent to 0.3 percent. Year-over-year, May 2016 home prices were up 5.6 percent. Mortgage applications decreased 1.3 percent from one week earlier but was up 16 percent from one year ago. The Refinance Index decreased 1 percent from the previous week. The seasonally adjusted Purchase Index decreased 2 percent from one week earlier. Purchases increased to 65 percent of all closed loans in June, up from 62 percent in May. Refinances represented 34 percent of closed loans in June, down from 37 percent in May. The average time to close all loans increased to 46 days in June, up from 45 days in May. Privately-owned housing units authorized by building permits were at 1,153,000 in June, 1.5 percent above May 2016 but 13.6 percent below June 2015. Privately-owned housing starts in June were at a seasonally adjusted annual rate of 1,189,000, 4.8 percent above May 2016 but is 2.0 percent below June 2015. Privately-owned housing completions in June were at a seasonally adjusted annual rate of 1,147,000, 12.3 percent above May 2016 and 18.7 percent above June 2015.